Coaching my son’s high school baseball team is not a career stepping stone for me. I don’t intend to coach as a career ever, but I do love pouring into these players for three months. The reality is that probably none of these kids are going to do this professionally and only a few might play in college. I don’t want to lose sight of that this season. 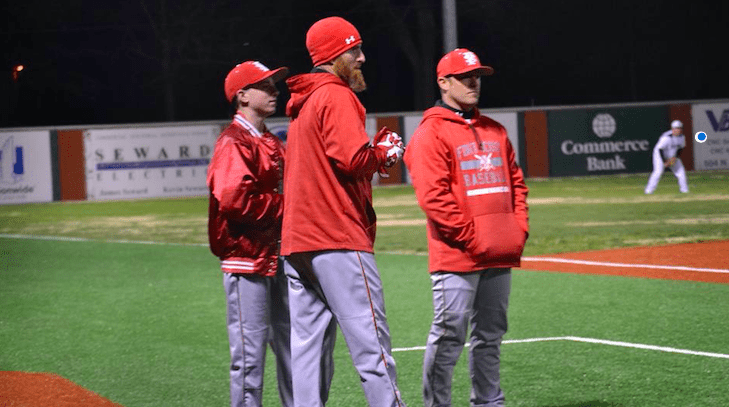 Our whole coaching staff is on board with the focus of this season being on the importance of character, developing great men instead of just amazing baseball players. I view this as a mission field, and I love to find creative ways to incorporate these life lessons into the game. When you’re around these guys long enough to get to know them, you start to hear and see some of the stuff that goes on in their lives and what they struggle with. The quicker we as coaches gain their trust and respect, the more they open up to us. The head coach, Josh Regan, is unapologetic and unashamed to preach to them before, during and after practices. There are many times when he’ll break something down and compare it with a message in the Bible, using our ultimate Guidebook as a guide for life and baseball. If we get a call from an upset parent one day, then I believe we’ve done our job. There’s no shame to share the Gospel, even in a public school where we are hired by the school district. So far, we’ve been incredibly open, and the kids have been very receptive to it. I remember a little while back giving the team a challenge. I wanted them to open their eyes to the people who are hurting in their school. It’s really easy to walk through school with your eyes on yourself, your friends and your own little world. I would give anything to redo high school with a different approach. I wish I could walk through the halls and classrooms with eyes open to those who are hurting and alone. I told the team that we have no idea what’s going on in their lives, but they may have no one to love them. I challenged them to step outside of the selfish attitude of thinking, “It’s all about me.” Something everyone of us falls into every day. The challenge was to go up to one of these kids and put your arm around them, ask them how they’re doing or tell them you like their shoes. Once or twice a week take someone out for lunch who doesn’t have anyone around them. I told them they’d be amazed what power this can have. Maybe they’ve never had anyone do this act of kindness towards them before. It may be uncomfortable, they may end up following you around the school or texting you for weeks after, but that lonely person may have just gained a new best friend. You might make their day, their year; this might be something they never forget their entire life! A week later I asked them how it went. It was really cool to hear from some of the players who accepted this challenge. Some said they did have that person following them around nonstop now or texting them at all hours. While we laughed and affirmed each other with these stories, I told them that we might just be able to see a school transformed by showing love to others like that. You don’t have to preach to them, just show love and that can do more in their lives than you could imagine. If we would make this a priority in our lives, not just in school but at work, in our neighborhoods and wherever we go, the effect can go a long way.